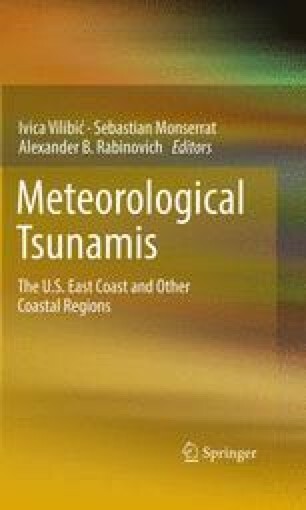 Tide gauge data were used to identify the occurrence, characteristics, and cause of tsunamis of meteorological origin (termed ‘meteotsunamis’) along the Western Australian coast. This is the first study to identify meteotsunamis in this region, and the results indicated that they occur frequently. Although meteotsunamis are not catastrophic to the extent of major seismically induced basin-scale events, the wave heights of meteotsunamis examined at some local stations in this study were higher than those recorded through seismic tsunamis. In June 2012, a meteotsunami contributed to an extreme water-level event at Fremantle, which recorded the highest water level in over 115 years. Meteotsunamis (wave heights >0.4 m, when the mean tidal range in the region is ~0.5 m) were found to coincide with thunderstorms in summer and the passage of low-pressure systems during winter. Spectral analysis of tide gauge time series records showed that existing continental seiche oscillations (periods between 30 min and 5 h) were enhanced during the meteotsunamis, with a high proportion of energy transferred to the continental shelf oscillation period. Three recent meteotsunami events (22 March 2010, 10 June 2012, and 7 January 2013) two due to summer thunderstorms and one due to a winter frontal system were chosen for detailed analysis. The meteotsunami amplitudes were up to a factor 2 larger than the local tidal range and sometimes contributed up to 85 % of the non-tidal water signal. A single meteorological event was found to generate several meteotsunamis along the coast, up to 500 km apart, as the air pressure disturbance propagated over the continental shelf; however, the topography and local bathymetry of the continental shelf defined the local sea-level resonance characteristics at each location. With the available data (sea level and meteorological), the exact mechanisms for the generation of the meteotsunamis could not be isolated. The authors acknowledge discussions with Ivan Haigh and Matt Eliot on various aspects of the sea-level data presented here. The weather records and meteorological data for this study were obtained from the Australian Government Bureau of Meteorology. We would like to thank Tony Lamberto and Reena Lowry (Department of Transport, Government of Western Australia) for facilitating the provision of the tide data and Ruth Gongora-Mesas for help in the preparing of the final manuscript.